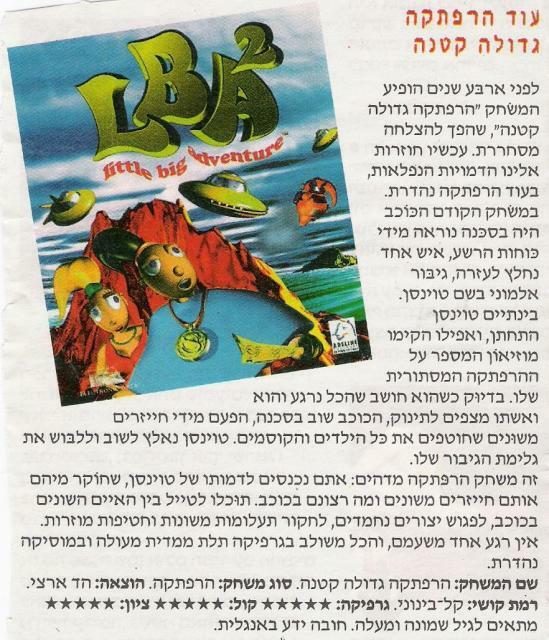 The game "Little Big Adventure" came four years ago, and became a tremendous success. Now the miraculous characters are coming back to us, in another wonderful adventure. In the previous game the planet was threatened by the forces of evil, one man rushed to the help, an anonymous hero named Twinsen. In the meanwhile, Twinsen got married, and they even built a museum telling about his mysterious adventure. Just when he thinks that all is clam and he and his wife are expecting a baby, the planet is in danger again, this time by strange aliens who kidnap the children and wizards. Twinsen has to put once again his hero tunic. This is an amazing adventure game: you enter the character of Twinsen, who explores those strange aliens and their purpose of coming to the planet. You can travel across the different islands on the planet, meet nice creatures, explore weird mysteries and strange disappearances. There is no one boring moment, and everything is combined with great 3D graphics and marvelous music. Game title: Little Big Adventure. Game genre: Adventure. Publication: Hed Artzi. Difficulty level: Easy-medium. Ages eight and up. English knowledge compulsory. All times are GMT +2. The time now is 21:58.